A customer was very lucky to find a Royal P Model in great shape. There are lots of these Royal 470's out there. This one has cool type. These early 1940's Quiet de Luxe are very popular with young writers. Tom, you really should do a post on your service calls, that would be something really unique and interesting for the Typosphere. I, for one, would look forward to your stories. That's one very handsome Royal QDL. Yeah. I'm 13 and I love QDLs. Thats one heck of a Royal P. I recently saw one in a thrift store, but thought the price was way too high for it's condition. The typeface on that 470 is rather attractive! Does it type nicely? I have to second Ton's request: please post about these service calls! I really like that Royal model P. Does it have the Vogue typeface? Ton- I think I'll start jotting down some of my favorite places and work up some stories. I do go to many amazing places. Thanks for commenting. Will- Can't go wrong with a classic QDL. I like them too. 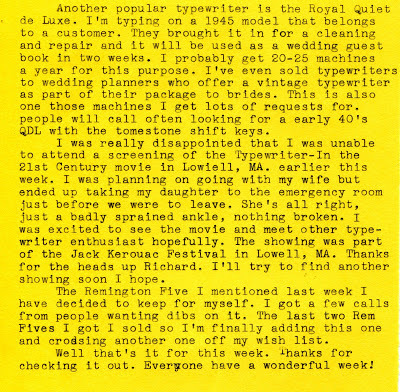 Glad to see so many teenagers digging typewriters. I'll check out your blog. Thanks. Ken- The 470 does type nicely. Service call stories are coming. Thank you for commenting. Bill- The Model P is just regular pica. Only once have I seen Vogue type on a Royal portable. I hope to have one in my collection someday. I too would love to read about interesting service calls. We're fans of the MIT Media Lab from afar. My youngest girl has been obsessed with the idea of MIT after watching some of their videos (she had better buckle down and work towards scholarships). Check out "Boxie" if you get a chance. 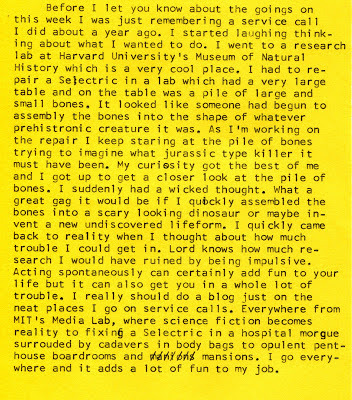 Your bone story reminds me of working at a KFC many years ago while I was in college. I used the corn skewers to reassemble the extra crispy chickens when I got bored. I love those 40s Royals. I have an Aristocrat and it is probably my favorite machine. I have one of those big ugly 470s right here, with a droopy carriage return I need to fix (I think there is a spring somewhere that needs to be replaces, it flops all over the place). Got it for $20, seemed like an ok deal. 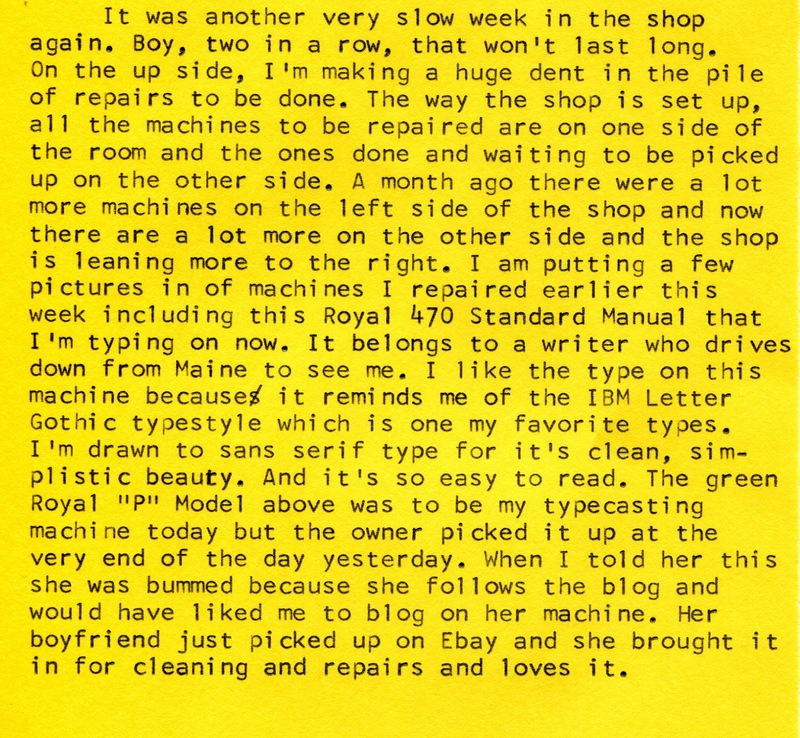 I haven't typed on it and I hope it has a cool typeface but I doubt it. So sorry you missed the documentary but so glad your daughter is okay! I too would look forward to the service call stories. And that Royal P is to die for! 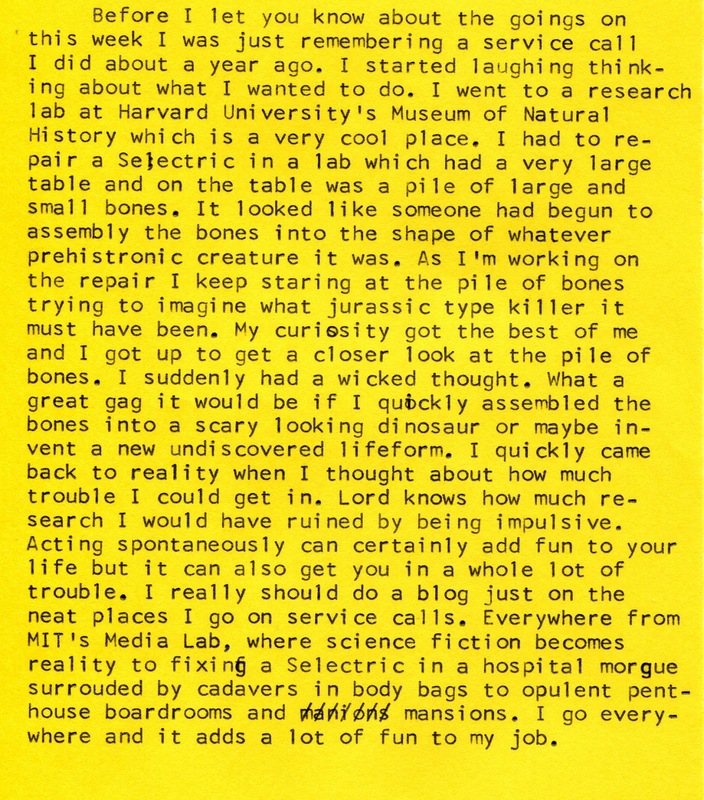 Dwayne F.- Twenty five years ago my old boss gave me a book about where science is going in the next 50 years and they had a big section on the Media Lab at MIT. It was mind blowing what they were doing there so I've a fan ever since. The visual I'm having of you at KFC is making me laugh. Thanks! Mark- Thanks for commenting. Sounds like the spring is broken or missing. It takes a heavy gauge spring and cut it to fit. Anna- Thanks for your comments. Love your blog!!! I really enjoy your posts. Keep up the great work. Can't say the Royal 470 is beautiful, but it seems to do very nice work. Thanks for another interesting post and I hope your daughter is 100% OK soon. 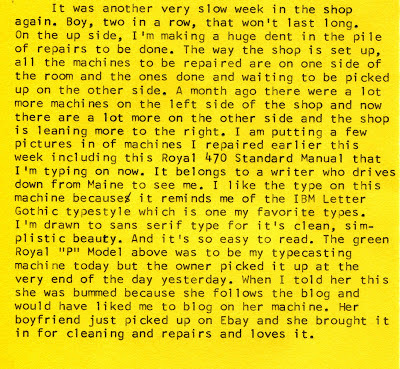 Your comment about repaired machines on one side and those waiting for repair on the other, brought back memories of my part time job while in college. I worked for a scientific glass blower, doing office work, deliveries, shipping, etc. He had an old roll-top desk, with many cubby-holes. One for bills we owed, and one for unpaid invoices for customers. The owner would squeeze each pile every morning, and say "we're still solvent. I think." 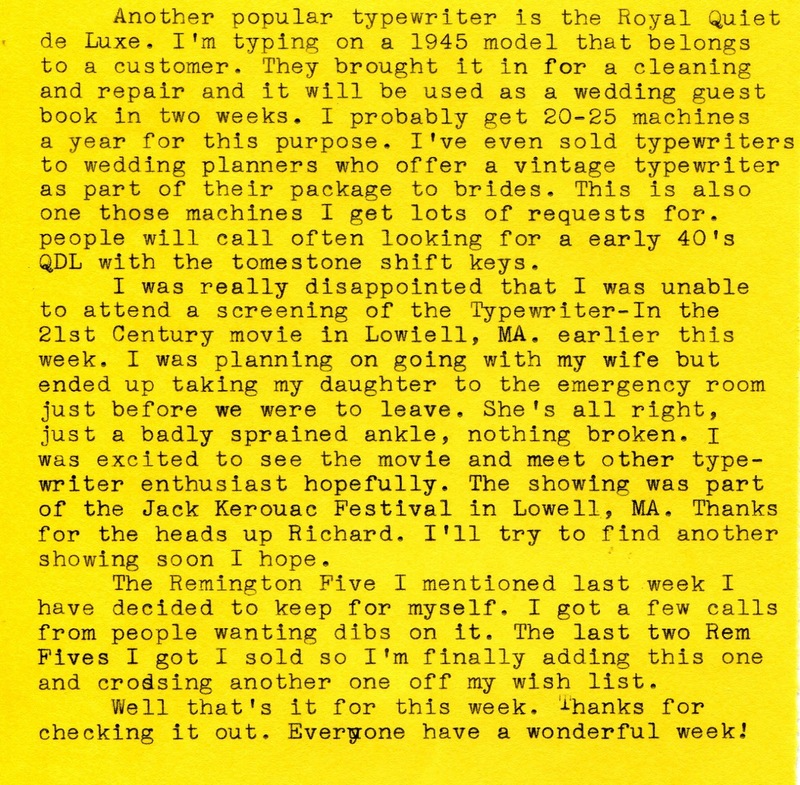 I was searching your site & google to find info about our royal 470 13-1542509 typewriter. I don’t know if it goes by another name? It looks just like the one above. I think it’s from early 70’s?? I’d like to find/purchase a manual & ribbons for my teen son who owns this. We live in KC any good repair peeps in our neighborhood? Thanks for any help! !